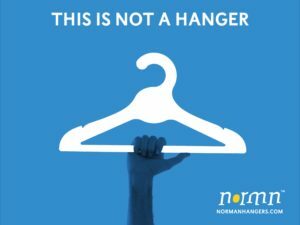 Textile Innovation Fund (TIF) has taken an interest in NORMN Hangers. The investment will give NORMN Hangers the opportunity to expand it’s position as a leading innovator in sustainable fashion utilities. The purpose of the investment is to bring to market NORMN Hangers’ breakthrough developments and accelerate the transition to circle economy solutions in the fashion industry. The company offers a complete sustainable clothing hanger solution for fashion outlets worldwide, replacing single-use plastic hangers that are currently used to transport garments from factory to store. NORMN Hangers are manufactured in the Netherlands, with offices in the UK and Denmark. The company was founded in 2011 with the goal to develop paper-based hanger solutions to replace the billions of plastic hangers used and thrown away every year. The patented products are made out of scrap paper and can be dispose of at any old paper recycling station. NORMN hangers are trusted by more than a hundred fashion brands in over twenty countries. ‘NORMN Hangers is a company with ambitious goals, a proven trackrecord and a sustainable vision. Combined with the quality of management, are these the pillars we based our investment on,’ says TIF fundmanager Susan van Koeveringe. TIF stands for innovation in textile business: from fibre to bits, and from strings to sensors. The fund is managed by BB Capital Investments from The Hague and provides growth capital, network and expertise for scale up companies in a various range of textile industries. BB Capital Investments is responsible for the management of the the Textile Innovation Fund. BB Capital is an investment company based in The Hague with a focus on sustainable growth within private equity. © 2018 BB Capital Investments - All Rights Reserved.